This is a newest complet standard 20mm TSOP adapter set for Willem programmers Version 3. It is for both True-USB Willem programmer and all parallel Willem Programmers. It is the best for GQ-3X and GQ-4X. The adapter set can be used for all standard 20mm TSOP32,TSOP40, and the TSOP48 package chips. 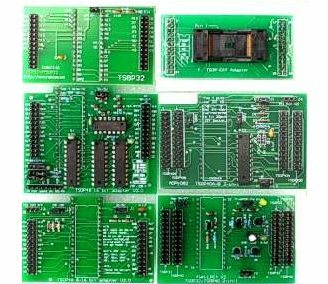 The set comes with TSOP48 ZIF board, 5 base boards and 3 address wires.